Your can has several systems that can leak oil or fluid. Engine, transmission, front differential, rear differential, brakes, cooling system, and power steering all can leak oil or fluid which can possibly lead to part or system failure. It takes a great mechanic to look at your car and determine what and where a leak is coming from and a quality repair job to seal it up. At Guy’s Automotive, our mechanics are the best and they can find your leaks and fix them right. 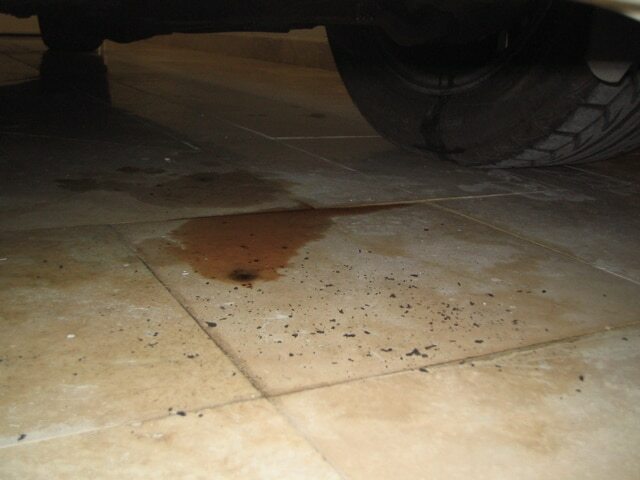 Engine oil leaks have several possibilities. Typical engines have gaskets like valve cover, oil pan, and cylinder head as well as seals like front engine crank seal, rear engine crank seal and over head cam engines might even have cam seals. Some cars might have additional gaskets to leak like oil pump gaskets or oil cooler systems. Whatever is leaking engine oil, if not taken care of, could leak all of your engine oil and cause an engine failure if the oil level gets too low. Transmission fluid leaks can lead up to a transmission failure quickly. A manual transmission has lots of bearings and gears that must have lubricant. An Automatic transmission requires fluid to maintain transmission pressures otherwise it can ruin the clutches, seals, or bearings which ruin the transmission. Front and/ or differential leaks will ruin the bearings and gears inside that help deliver the torque to your wheels. Brake fluid is what the car uses to hydraulically stop the car. This could be dangerous if you loose the fluid to the point the car will not stop. Running this fluid low can cause ABS/ Traction control or master cylinder failure which can also substantiate the costs of your repairs as well. Coolant leaks will cause a car to overheat. If your engine runs too hot, it can blow your head gasket or your engine. A leak as simple as a hose clamp, if un-repaired, can do thousands of dollars in damage. Power steering leaks can damage vital steering components like the rack n pinion or gear box and or the power steering pump. The power steering pump has bearings in it and will fail quickly without lubricant. You steering in the car will stiffen when it is low on fluid. What ever the leak, Guy’s Automotive can help. If there is oil dripping on your driveway or you smell burning smells from your vehicle, call Guy’s Automotive and schedule an appointment to have your oil leaks checked and repaired today. We have the tools, experience and equipment to solve all your oil leak problems. We are the best “Auto Repair in Tampa” repair shop!